I told them to download the videos with F12 tools, and they weren't clear how. I'll use an Azure Friday video for the example. Do be aware that there are a ton of ways to embed video on the web and this doesn't get around ones that REALLY don't want to be downloaded. This won't help you with Netflix, Hulu, etc. First, I'll visit the site with the video I want in my browser. I'll use Chrome but this also works in Edge or Firefox with slightly different menus. Click the "clear" button to set up your workspace. That's the International No button there in the Network pane. Now, press Play and get ready. Look in the Media list for something like ".mp4" or something that looks like the video you want. It'll likely have an HTTP Response in the 20x range. In Chrome, right click on the URL and select Copy as CURL. If you're on Windows pick cmd.exe and bash if you're on Linux/Mac. You'll get a crazy long command put into your clipboard. It's not all needed but it's a very convenient feature the browser provides, so it's worth using. Get Curl: If you don't have the "curl" command you'll want to download "curl.exe" from here https://curl.haxx.se/dlwiz/ and, if you like, put it in your PATH. If you have Windows, get the free bundled curl version with installer here. Open a terminal/command prompt - run cmd.exe on Windows - and paste in the command. If the browser you're using only gives you the URL and not the complete "curl" command, the command you're trying to build is basically curl [url] -o [outputfile.mp4]. 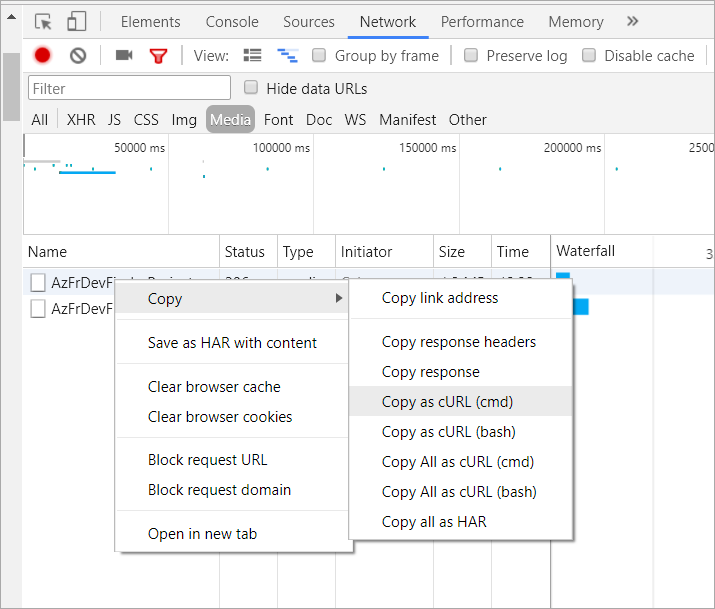 It's best if you can get the complete command like the one Chrome provides, as it may include authentication cookies or other headers that omitting may prevent your download from working. GOTCHA: Make sure to remove the -H "Range:" headers (if any) to ensure you get the FULL download and not just a range of bytes! BEFORE you press enter, make sure you add "-o youroutputfilename.mp4." Also, if you can an error about security and certificates, you may need to add "--insecure." In the screenshot above I'm saving the file as "test.mp4" on my desktop. 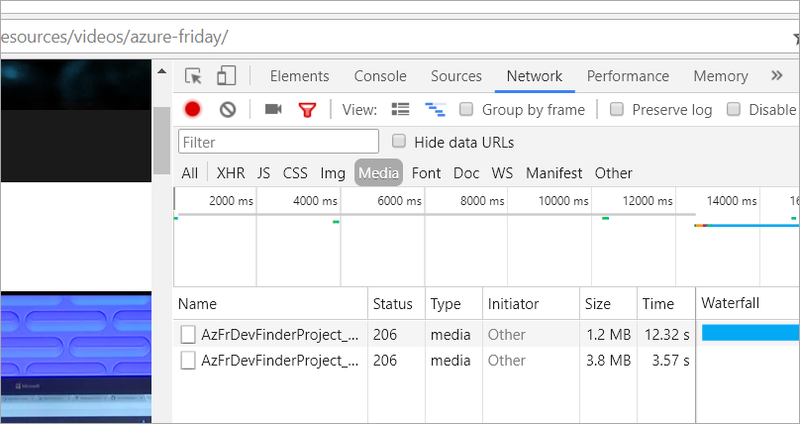 Firefox makes this even easier without using the developer console. Right click -> View Page Info, select Media tab, select video in list, click on "Save As..." button. If you're trying to download the full video, you'll need to look for and remove any ranged request headers. These will cause only part of the video file to be downloaded. Good catch Jami, I will update the post to reflect that! This is definitely useful for embedded videos that don't have a download link. 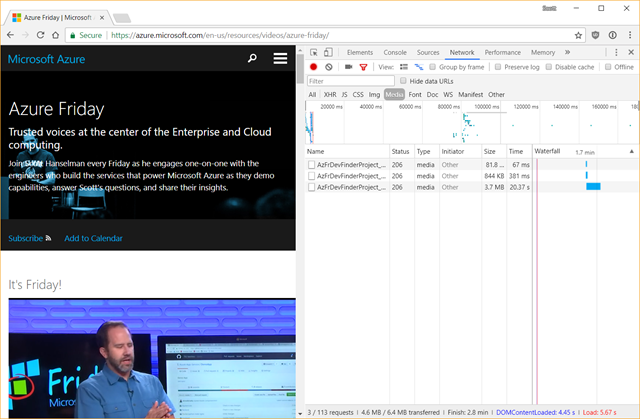 For the Azure Fridays videos, you can just click the Ch9 button in the lower right of the video player to view the video on the Channel 9 website. The Channel 9 video pages have download links for 3 video quality levels and MP3s. I usually try youtube-dl (local python script running in WSL, but I think there is also a stand-alone Windows binary) first as it supports quite a lot if video sites before I resort to the techniques you describe. @WSL users, "cclive" is quite nice. I made an app to download stuff from youtube. Only use it to download your own previous uploaded videos that you've lost and want to recover of course. Could you not also use PowerShell? is out though, as it buffers it first. I would like to mention that this technique is great for trouble shooting pesky problems if you are working on a SPA or ajaxy application. This trick has saved me so much time when debugging when I can find the pesky operation on the browser capture the curl command to reproduce it so I can debug things on the server end (or if it is easy to set up a similiar scenario that you want to test then you can fiddle with the json payload to the server to see what it will do). As I have gone about learning about the features in dev-tools I have been amazed at how useful some of them are ... copy as curl is one of my favorites. In chrome you can right click that video and open in the new tab and right click on the video and select save as. 3. Go to Network tab and then click on Media. 4. Now refresh using Ctrl+F5. 5. Click on the result in Media now and copy the link address. 6. Open the copied link address in new tab. It will open in video player which has the option to download on the bottom right corner.